I can’t say Hamburg had the stubbornness of River City, Iowa, (after all, Hamburg is the “Town that Friendship built”), but I can attest to an idyllic feeling growing up off South Park when it had only two lanes. And like the magical concluding scene of The Music Man, my brother and I (and maybe even my mother and father, too), couldn’t wait to gaze in awe as the marching band led the parade down South Park to signal the beginning of the Big Tree Fireman’s Carnival. We’d watch from the second floor apartment above my grandfather’s pizza parlor across the street from Abbott Parkway where we lived. There was something dazzling about that marching band, and something incredibly comfortable about watching it from the large picture window overlooking the Avenue. There was also something indescribably exciting about that annual parade. It was an anticipatory pleasure for me and my brother, for we knew as soon as the parade ended, we would immediately head for the carnival. But the carnival, while fun, only signaled the coming of something bigger: the annual Erie County Fair, or, as we (and many others) called it, the “Hamburg Fair.” Funny thing about the two events, though. While the Big Tree Fireman’s Carnival parade reminded me of The Music Man, the carnival did not. On the other hand, although the much larger Fair parade didn’t evoke feelings of The Music Man, the fair itself oozed of River City. You might think Meet Me In St. Louis a better movie to compare to the Fair, and, for some, that may be true. For me, however, the sly con of Harold Hill and, much to his own surprise, his and River City’s eventual transformation matched my own journey from boyhood to manhood, a journey that trekked through the Fair. Before I get too involved in how the Fair helped shape my character, let’s go back in time to the very beginnings of the Fair. Greater Western New York grew first as an agricultural region. It was (and some say it remains) colored more by the same soft brush of the Midwest farm belt rather than the spray painted tag of the urbanized East Coast. And if there’s one American tradition best suited for farmers, it’s the annual county fair. It seemed like every county in America’s rich heartland held these yearly affairs and they became more than a social gathering of the local growers, but a showcase for the county and its people. I still call it “The Hamburg Fair” and I expect many who grew up in Hamburg still proudly refer to it by that name. The Fair generated a lot of pride in our community and in our family. Historically larger even than the New York State Fair, in 1970 it became the country’s largest county fair.13 It has since slipped to the third largest county fair and, in that last decade or so, the New York State Fair has finally generated most visitors than the Erie County Fair (but just barely). That the Fair is such a part of me and such a jewel in our community, I naturally assumed everyone felt the same way. But I’m constantly surprised, even to this day, when I find someone from the north towns of Buffalo who has never benefited from partaking of the Fair. Heck, there are people in Rochester who make the annual trek to the Erie County Fair! How could these Buffalonians forsake their own county’s shining star? Oh well, here’s why the Fair became so important to me. Like the glamor of The Music Man, the Fair was one big show, with Hollywood entertainers often headlining the acts. It possessed a circus atmosphere – it even had (and still has) a Midway that arrived by train, just like an old circus. But there was one thing that made it most special to me and my family – it was a show that, since 1957, we were in! You remember my grandfather’s pizza parlor on South Park I mentioned earlier? It turns out my grandfather, although an entrepreneur – he once owned a grocery on Ridge Road in Lackawanna – only started the pizza parlor because my young mother nagged him. “Dad,” she said one day in 1954, “it’s the latest thing. All the kids are going. Besides, you can’t make any money in the grocery business anymore, not with those big guys like A&P coming in.” My grandfather, of course, reacted like any father would when his smart-aleck teenager tries to tell him what to do. I’m not saying there was a sonic boom on Ingham Avenue that day, but you get the picture. Apparently, he refused to believe anyone would order out something they could easily make at home. Still, by 1956, my grandfather had started the area’s first pizza parlor, at least according to my mother. Now, I don’t know how you reconcile “all the kids are going” with my mother’s claim that it was the first pizza parlor in the area, but that’s her story and she’s sticking to it. There must be some truth to the story because, when word got around at the Lake-Erie Italian Club that Ilio DiPaolo wanted to start a pizzeria, my grandfather gladly leant Ilio the benefit of his experience. Well, back in the old days, the Erie County – er – Hamburg – Fair had a tent where the local restaurateurs would set up to sell their culinary creations. It was there my grandparents first brought their pizza to sell to fairgoers. Soon, that makeshift booth beneath a shared tent became a free standing wooden stand across from the original main entrance to the grand stand at the top of the Avenue of Flags. That’s where I remember hanging out as a little kid when I was too tired to tour the Fair or when my parents wanted to go see one of those Hollywood headliners. It’s also where we’d escape from the crowd after witnessing the ultimate in coolness (for an eight-year-old at least) – like the Hell Drivers or Joey Chitwood’s Thrill Show – or the ultimate in excitement – the massive demolition derby. Our neighbors always had a car in it. We cheered for them, but they never won. Perhaps the greatest personal impact the Fair had on me occurred during the few years I worked there for my grandparents. Oh the stories I could tell. In fact, one of these days I might be inclined to pen a book along the lines of Every Thing I Learned I Learned at the Hamburg Fair. For the purposes of this book, though (and this chapter is already running too many words), suffice it to say the Fair shares that quaintly all-American feel of the The Music Man’s River City – for all its charm, all its lost innocence and all its carnival atmosphere. Judging from an Orange County (NY) reporter’s account in the 1890s, “This Fair is unique among the County Fairs of the Empire State. First, it is well attended, and therefore successful financially; and, second, it can boost of being the most remarkable gathering of fakes on this earth…,”14 since more than a century ago, the circus-like magic of The Music Man rings true. Or at least it once did. Perhaps, in briefly calling itself “America’s Fair” as it did in the 2000s to broaden its appeal, the Fair began trying too hard. The success of the Hamburg Raceway’s Casino hasn’t helped. The soft pebble gravel – that you once walked on, that once kicked up that country dust, that once coated your country sweat on those especially hot days – has long ago been replaced by the heartless hardness of asphalt. Yes, they paved paradise and made it a parking lot. But they could make as many changes as they want. They can get rid of the double Ferris Wheel – which we could see from Highland Avenue on a clear day. They can get rid of the Sky Way that once flew above the Midway and, from which, much to the distress of those walking below, occasionally rained little red I-Got-It! balls. They can outlaw rickety wooden vendor stands and replace them with antiseptic Jetson-like trailers. They can even charge vendor rates so high the Boston Church can’t sell enough pies to afford the rent. They can do all that, but they can never remove the memories of River City. The memories where, for one week (or ten days) a year, I got to live the 16-hour work day life of a carny (my grandparents insured I never found out what they did the other eight hours). Or, the memories where, by working so closely with my grandparents, I received invaluable education about life, family and fun. Among these include showing unconditional love for their children despite yelling at them for the silliest reason, like the time my uncle showed up one afternoon with a cardboard display of cigarette lighters. Boy did my grandfather’s voice explode when my uncle suggested we sell them. Still, he frightened no one as, despite his obvious expression of anger, we just couldn’t get past those crazy oversized novelty sunglasses he was wearing. Finally, there are also the memories where, by seeing how my grandparents managed the pizza stand, I gained practical experience so important today in running my own business. Heck, how could I ever forget the lesson covering inventory control and open-minded flexibility, or, as we liked to say, “thinking outside the pizza box.” One night we ran out of pizza just as the evening rush from the grandstand descended upon us. Desperate – in a Mr. Krabs sort of way – to satisfy all those customers too willing to separate their dollars from their wallets, my grandfather began selling anything not nailed down in the stand. This included all those lighters in the cardboard mounted display my uncle had brought in earlier that day. My grandfather sold the first one before letting my uncle sell the rest. As long as the Erie County Fair continues to promote local celebrities (along with the headliners), as long as they continue to feature long-time local vendors (yes, the family pizza stand – now a trailer – remains, operated by my [other] uncle and his family), as long as they continue to feature the arts, crafts and historical exhibits of local creators (alongside the traveling road show of James E. Strates Shows), then I’ll be happy knowing future generations will be able to experience a county fair the way past generations have. And this I can guarantee, for, despite all these changes, my own children, who never experienced the same Fair I did growing up, nonetheless look forward to the annual visit to the Fair. And while every time I step through Gate 2, imagining I’m going back to that old pizza stand, I’m content knowing my children are building their own “River City” memories. 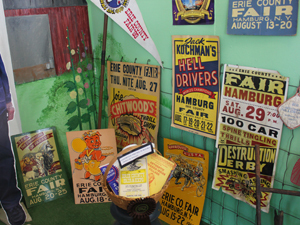 On a scale of one to ten, they, like I, rate the Erie County Fair “76 Trombones.” But they also have experienced more than just the Hamburg Fair, for Greater Western New York was once and still is filled with these destinations of amusement. We’ll explore some of the interesting history in and around these sites in our next chapter. He was there, too. In fact, in addition to our familial bind, we developed the classic business relationship of “Mr. Inside” and “Mr. Outside” while working at the stand. I’ll give you a chance to guess which one of us played each role. You’ll find the answer in the aforementioned “Everything I Learned…” book referenced in the article. As an author, the use of various literary devices can offer the reader a easier and clearer understanding, as well as provide comic relief. The key, though, is to never reveal too much. So, the more compelling question is, “Do I really have a brother?” The best way to find the answer, of course, is to ask him yourself. But, that would assume he’s real, and that may be too big an assumption. The next best thing is to find a friend of his. May I suggest starting with Al – er, I mean – all potential leads. But, ALas, I cannot remain this mysterious. I’ll leave you with two clues which may help you find your answer: 18 and 22. Happy hunting. Let us know if you find anything.